The ruined church of St Genevieve, marooned in the park of Fornham Hall to the north of Bury, holds a special place in the story of this website. Suffolk has about five hundred surviving medieval churches, and the ruins of a dozen more, and the known sites of a further twenty or so. And out of all of these, this was the very last one that I visited. The tower, which is all that survives, stands on private land, a good half a mile from the nearest road, and for a long time it was was pretty well inaccessible. I knew people who had been to it, and I had seen their photographs, but I had received far more e-mails from people wondering how on earth to get to it. Although the church is only a mile or so north of Bury St Edmunds, it stands on wild heathland, and is not reachable from the village of Fornham St Genevieve itself. Instead, you have to approach it from the north, along a track which begins on a back road near Culford. In the old days, this would have meant risking the wrath of the owners of Fornham Hall, but today the Hall stands empty, and is being converted into apartments. The church was destroyed by fire in 1782, and was derelicted in 1813, by which time the parish had been made a joint one with Fornham All Saints. In later years, it stood service as a water tower for the Hall. 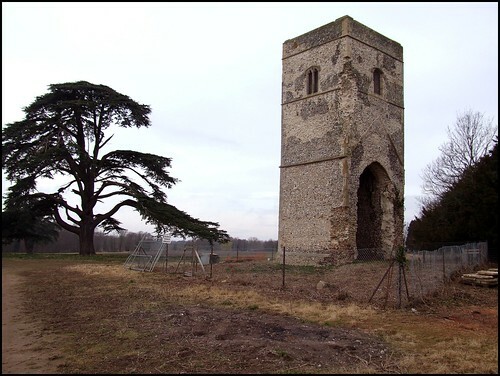 The tower is interesting from an ecclesiological point of view, because of course it never underwent a Victorian restoration, and is probably what many East Anglian towers looked like before their bell windows were renewed by well-meaning 19th century architects. By the 1980s, the site had become rather overgrown, but has been cleared in recent months, and a pile of rescued 18th century gravestones lies on pallets beside the site. It would be nice to think that they might be reset in an appropriate manner. The tower is surrounded by safety fencing, with a warning notice. But many East Anglian ruins have been made safe for public enjoyment in recent years, largely due to the energy of Norfolk County Council. They have no jurisdiction here of course, but it would be nice to think that their example might be followed.